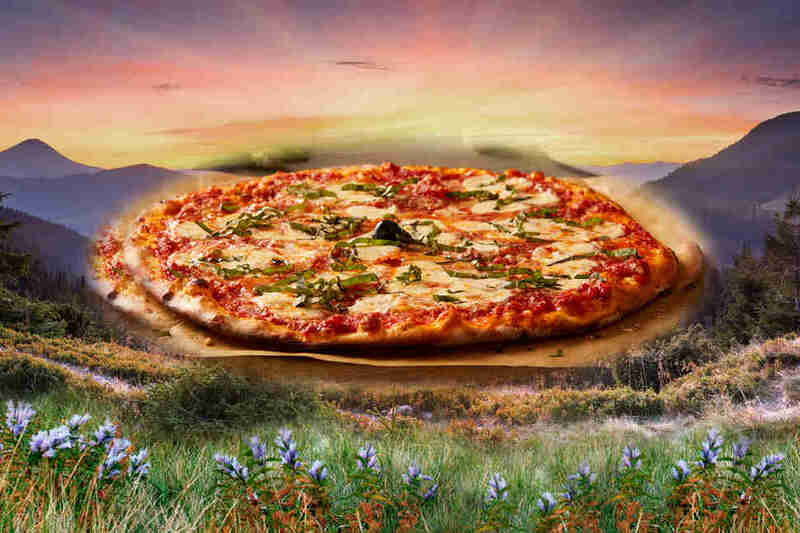 Of the 16 restaurants in Wellesley, Massachusetts, in the late ’90s, 10 were pizza places. Peter’s Pizza was the Greek pizza place you went to get steak and cheese subs with pepperoni, Danny’s Pizza was the Greek pizza place you went to buy pot from that kid who dropped out of UVM, Mark’s Pizza was the Greek pizza place you went to get boneless buffalo tenders, Nick’s Pizza was the Greek pizza place you went to get mozzarella sticks and weirdly delicious toasted veggie subs, Joe’s Pizza was the Greek pizza place you went on half-day Wednesdays because it was next to White Mountain Creamery, House of Pizza was the Greek pizza place no one ever went in, Deluxe Pizza was the Greek pizza place where you ate slices provided to you by a man named Manny while you waited for someone in their parents’ car in the parking lot to tell you whether or not people were drinking in the woods behind Bates, Papa Razzi was the fancy pizza place you’d go to with your mom and stepdad on a weekend night, Domino’s was the chain pizza place you’d order delivery from after you stopped by Danny’s Pizza, and then there was Bertucci’s. Founded in 1981 in Somerville, Massachusetts, by local kid Joey Crugnale, who’d apparently gone to his grandmother’s hometown in Italy and came back inspired to build a brick oven, Bertucci’s was strictly a small Massachusetts chain through the ’80s. In 1989 they opened their Wellesley location in the old, beloved Community Playhouse movie theater space, and the massive, airy ex-theater with exposed concrete walls always seemed a little too big, and gave it a weirdly unintentional, almost prescient industrial urban vibe that would become de rigueur in fine casual restaurants post-2006. Because the Greater New England suburban pizza world was dominated by a Greek-style (also known as House of Pizza- or diner-style) that was uniformly over-cheesed, over-sauced, over-oregano-ed (Note: Greek pizza places didn’t necessarily need to be run by folks of Greek origins, they just had to make pizza in this particular style), and cooked in medium-height oiled pans that sit somewhere in a realm several rungs below deep-dish but above any traditional thin Italian pizza, we didn’t quite know what to make of Bertucci’s. No one was complaining about the Greek-style because we’d all grown up on it and thought it delicious (Author admission: I still kind of love it). My pizza ideal at the time was Peter’s, mostly because I had memorized their number in middle school and sometimes felt bold enough to order a medium pepperoni pizza to my house while my mom was working. 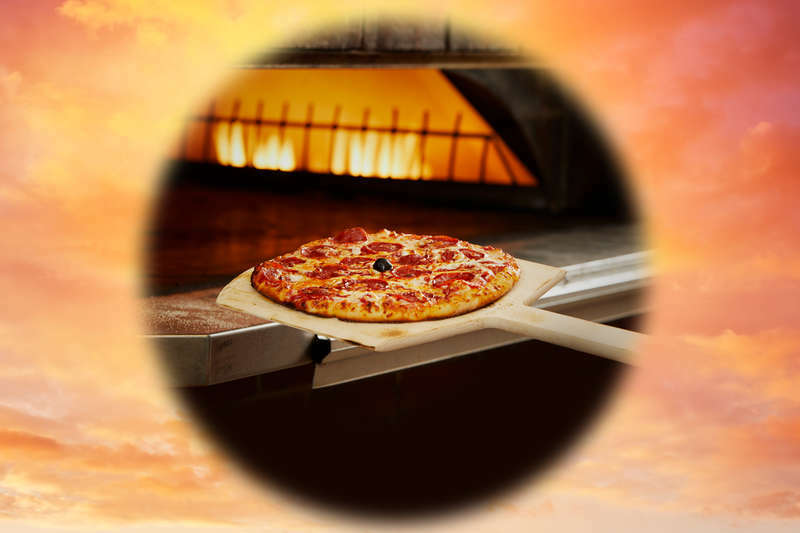 Bertucci’s used a brick oven, and as the physicist Andreas Glatz concluded in a paper studying the optimal pizza ovens, brick transfers heat to the dough more slowly and offers only indirect heat to the toppings, so water can boil off from the tomato sauce and the cheese can melt without burning while the dough cooks through and maintains moisture. The Bertucci’s pizza, which used fresh dough made it each morning, proofed for 48 hours, and stretched by hand, featured a thin crispy crust and a chunky tomato sauce that might’ve been actual crushed tomatoes and real mozzarella cheese. It didn’t have a slick, oiled-bottom spongey crust or thick oily cheese on top like the Greek pizza and there didn’t seem to be at least four hearty shakes of Oregano anywhere, so naturally when I first tried it, I hated it. THIS IS NOT A MEDIUM PETER’S PEPPERONI PIZZA, I shouted at my mom as she tried to do a nice thing for her family and take them to a meal in the concrete shell of a giant movie theater. WHY AREN’T MY FINGERTIPS DRIPPING WITH OIL?!?! AND WHERE IS THE GIANT SHAKER OF OREGANO?!?! But then I had their rolls. The pride Bertucci's took in their roll game was unlike anything I'd ever experienced before. 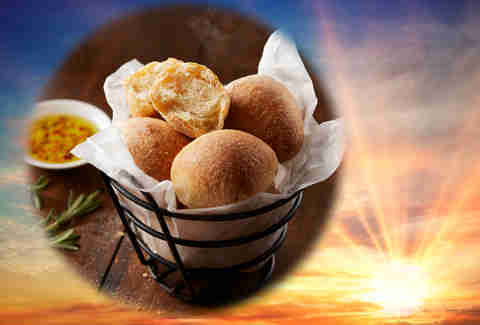 Do you know about Bertucci’s rolls, friends? Have you ever been to the Museum of Natural History and traced your hand along the bumpy, pebbled contours of the triceratops skin, even though you weren’t supposed to touch the display? The outer shell of a Bertucci’s roll felt like that, a little rough, almost like an oversized golf ball rubbed with the type of medium-grit sandpaper Bob Vila would recommend on his website. The inside was doughy, pillowy, and fantastic, especially if you took the little butters they gave you and immediately opened the rolls like clam shells, shoved the butter inside and then closed it back up while it was still hot. And that was the other thing. Or maybe the entire thing. They were always served so $%&*ing hot. The pride Bertucci’s took in their roll game was unlike anything I’d ever experienced before. Even when we’d visit the predominantly Italian North End of Boston before Celtics games, the bread basket was always an afterthought of cold, sliced Italian bread served up with some olive oil and fake balsamic vinegar. But here were these piping hot rolls served with salted butter and olive oil, and there are few things in life more glorious than dipping warm bread in a fatty product and then shoving it into your mouth. But there was something else. As we got older and went to high school and spent the majority of our time across the street from Bertucci’s at Deluxe Pizza and Charlie’s Variety, waiting for word that someone’s parents made the crucial error of trusting their kids enough to go into Boston for dinner and a movie, a few of us got jobs at Bertucci’s. And because high school kids can’t be trusted with important jobs, most of my friends ended up at the takeout counter. And the takeout counter had a little something I like to call: UNLIMITED ACCESS TO ALL THE ROLLS. When you are a sophomore in high school, few things fill you with heady confidence like wandering into Bertucci’s and seeing your friend’s older brother Scott standing behind that counter surrounded by the impressive bounty of three baker’s dozens of brick oven-kissed rolls. Now sure, he may only kind of like you and mostly seem annoyed, but, regardless, in his haste to make you go away, he might throw three scorchingly hot rolls at you, and then you could take those rolls across the street to the parking lot where the other kids on the outskirts of popularity’s embrace were hanging out, and share the still-so-hot rolls, and laugh and cry and know that someday life will be more complicated and messy, but right now you have these really hot rolls which you got for free and you better enjoy them quickly, because Manny has a pretty strict policy against bringing outside food into Deluxe Pizza. As the ’90s turned into the early aughts, I went off to college in Hartford outside of the Sovereignty of the New England Kingdom of Greek Pizza and learned about other styles. My roommate from Brooklyn showed me the New York pizza at Dom DeMarco’s Di Fara, and we took road trips down to New Haven and tried the coal-fired legends Frank Pepe Pizzeria Napoletana and Sally’s Apizza. I dated a girl from Providence who brought forth the unexpected delights of the scallion-flecked grilled pizza at Al Forno, and another from Chicago who opened my eyes to the caramelized crusted pizzas at Pequod’s and the Lou Malnati’s deep-dish. And after college living back in Boston, I realized legendary local places like Santarpio’s and Galleria Umberto had been there the whole time, a commuter rail train ride away. Meanwhile, as I became an insufferable learned person cultivating a cosmopolitan pizza palate, Bertucci’s started to fly a little too close to the capitalist sun. After sticking around Massachusetts for 15 years, they began to expand rapidly, and by the early aughts there were over 100 locations from Mass to Illinois and Florida. And as they expanded, a typical story emerged. Customers complained that the product was no longer the same, the new spots lacked the atmosphere of the original dozen Massachusetts locations, and that menus were now chasing trends and lacked consistent quality. By 2011, Bertucci’s, like many of the mid-level sit down chain restaurants across America, began losing money, and started getting desperate, bringing back original dishes and trying out different concepts, but the novelty eight ball outcome wasn’t looking favorable. An early warning sign: At the end of March, 2018, on a snowy Sunday night after service, the Wellesley Bertucci’s quietly shut down after almost 30 years. At the time, they said the cause for the closure was “lease-related.” In a letter to customers who were members of their loyalty program, which is apparently called “Dough Nation,” they urged them to visit the Needham location “to satisfy your craving for our rolls, pizza, pasta and more.” Then on April 17, a bombshell dropped. Owing $120 million in debt obligations, Bertucci’s filed for Chapter 11 bankruptcy and closed 15 more of its locations. Tributes poured in all over social media. And then Boston Globe restaurant critic Devra First fired off a couple shots of her own. “I hate to break it to you,” she said in a column. “Objectively speaking, the rolls are not that good.” Her argument was basically that the bread in America is now so damn good as bakers have gone back to the Old World ways of making it using artisanal ingredients, etc., etc., Good Food Revival, etc., that judged in today’s context, the roll is just meh, and the payoff is really just the temperature at which they’re served (she also described the rolls as having “strange mottled skin, like a freckled person with a tan,” which is wonderful). The backlash against First’s declaration was swift (though in our social media age, isn’t that the only kind of backlash? ), but I kept thinking that her not unfounded observation about the state of rolls and bread could also apply to the state of pizza. When I first tried Bertucci’s in the early ’90s, I didn’t know the way pizza was supposed to taste because I only knew from the Greek-style I was raised on. With its brick ovens, Bertucci’s was at least trying to show us that there was something beyond the oil-slicked, oregano-spackled bland world we knew. Kevin Alexander is Thrillist's National Writer-at-Large and once ate seven Bertucci's rolls in Casey Hurley's dad's Isuzu Trooper while listening to a cassette tape. Hire him for speaking engagements @KAlexander03.